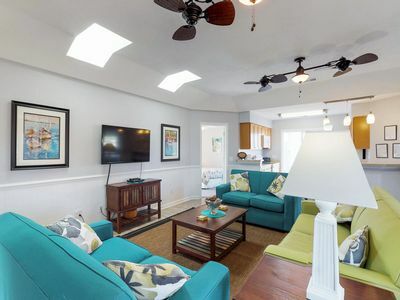 Escape from your daily routine to this charming 2-bedroom, 2-bathroom vacation rental condo nestled just 1 block from the Atlantic Ocean! 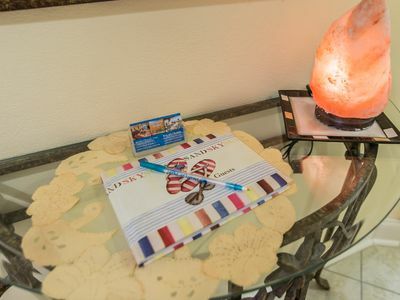 The property features 1,100 square feet of beach-themed space, a full kitchen, private balcony, and access to a multitude of community amenities like an outdoor pool, grilling area, and a playground. 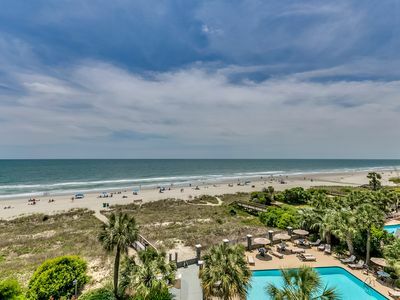 Whether you're in town to golf like the pros at Myrtle Beach National or cast a line off of Apache Pier, this is the perfect East Coast beach retreat! 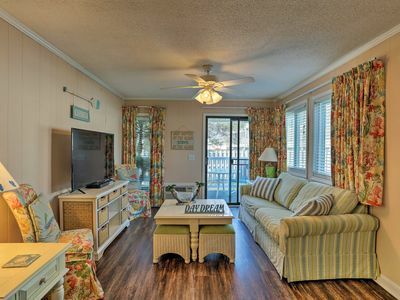 Nestled in a quiet neighborhood just north of Downtown Myrtle Beach, this ground-floor condo boasts vibrant interior design with plenty of beach-themed furnishings! 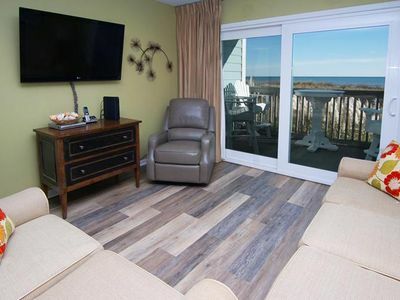 Featuring hardwood look-alike plank flooring, tropical window drapes with matching chair covers, and a flat-screen cable TV, this comfortably furnished living room will quickly become your go-to relaxation station. 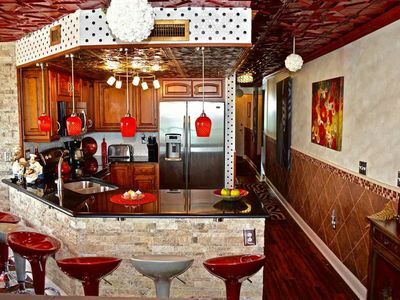 Before you head out the door, whip up a bite to eat in the fully equipped kitchen and enjoy it on the private deck coupled with fresh Atlantic Ocean air! 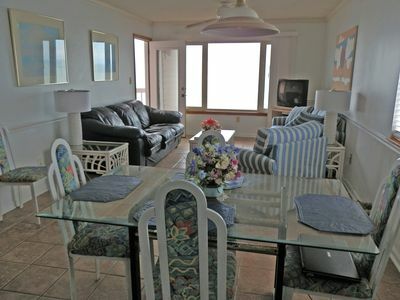 The balcony has a palm tree in the corner as well as a 2-person dinette that's perfect for coffee or cocktails. 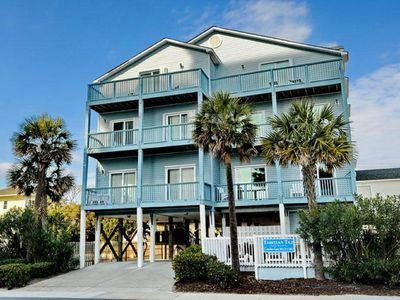 This condo is nestled inside A Place at the Beach 5 where you'll enjoy unlimited access to the community amenities in the complex like an outdoor pool, charcoal grilling area, picnic tables, and a prime location just one block from the Myrtle Beach coast. 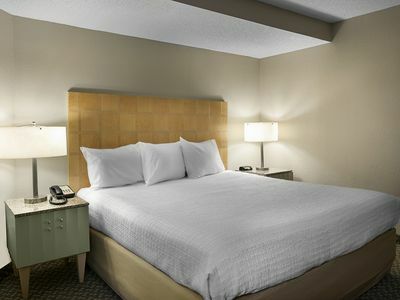 When it's time to hit the sack, make your way to one of the 2 bedrooms to rest on either the queen or 2 twin beds. Additional sleeping space is available for 2 guests on the cozy sleeper sofa in the living room! 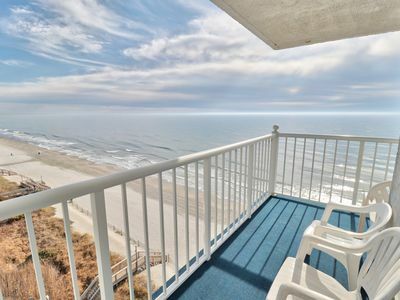 The beach is the main attraction of this unit and you'll be just one block away from the calming Atlantic Ocean. Take your pick of one of the many delicious eateries and exciting bars nearby including Fire and Smoke Gastropub, Hook & Barrel, Captain George's Seafood Restaurant, and Ocean Annie’s Beach Bar! The central Myrtle Beach area, about 9 miles from your door, offers plenty of on-shore and off-shore entertainment for all ages! 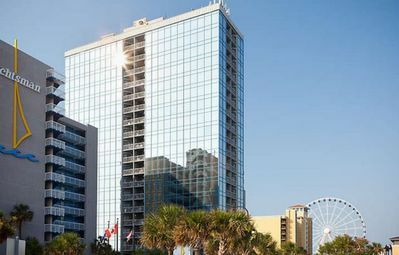 Explore the Myrtle Beach Boardwalk Entertainment District, bring the kids to the Myrtle Beach State Park, or book a deep sea fishing trip on a local charter. The Duplin Winery is another fantastic spot for those looking to try some local wine! Golf enthusiasts love the quick 4-mile drive separating you from the beautiful Dunes Golf and Beach Club. 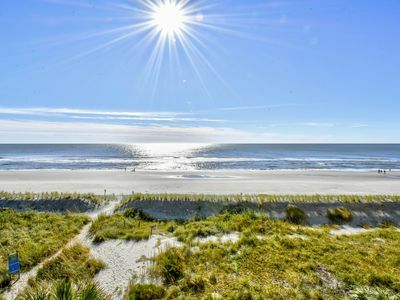 Other options for golf nearby include the Kings North Golf Course at Myrtle Beach International, Prestwick Country Club, and Caledonia Golf & Fish Club down south. 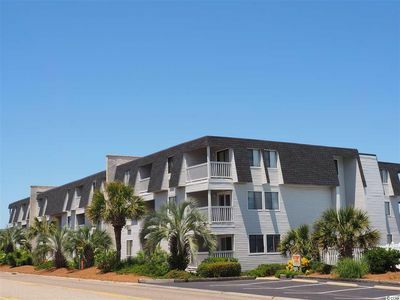 A few other suggestions for entertainment include fishing off of Apache Pier, watching a Pirates of the Caribbean Show, or simply enjoying retail therapy at the Tanger Outlets Myrtle Beach! Barefoot Landing is another hotspot for entertainment housing shopping spots and the House of Blues Myrtle Beach. 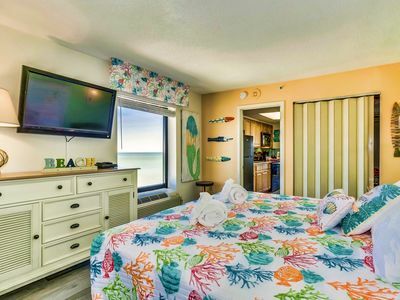 - Amenities include a fully equipped kitchen with a dishwasher and the cooking basics, a private balcony with a 2-person dinette, beach-themed interior, a sleeper sofa, 3 flat-screen cable TVs, 2-person high-top table, in-unit laundry machines, free WiFi, and more! 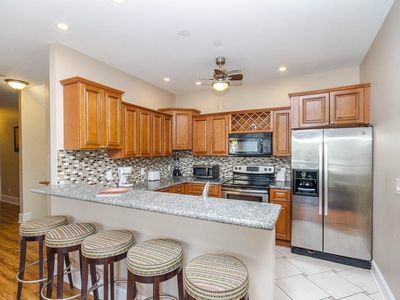 Spacious Open Floor Plan/ Coastland Cottage in Ocean Lakes with WiFi. 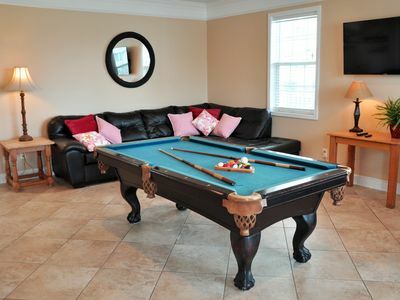 Huge Townhome, perfect for large families, pool table, incredible kitchen! 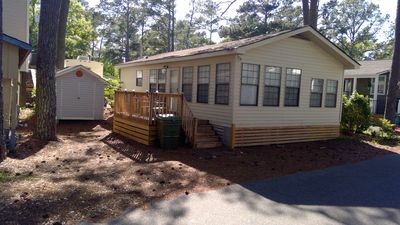 Beautiful BAREFOOT RESORT 2BR Golf Condo*Ground Floor*New Paint* 50''TV*2 Pools! 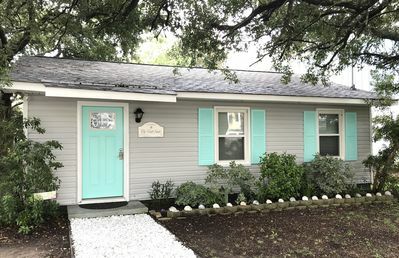 On the "Half Shell", Adorable Beach Cottage, Steps to the Ocean, Pets Welcome! 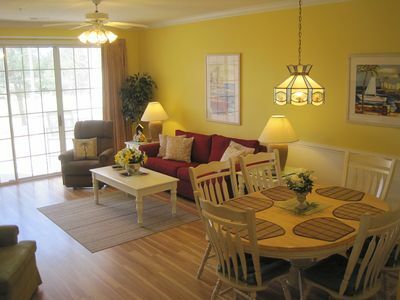 Snowbird-friendly cottage w/ shared pool - walk to beach, pier, dining, & more! Look no further.. 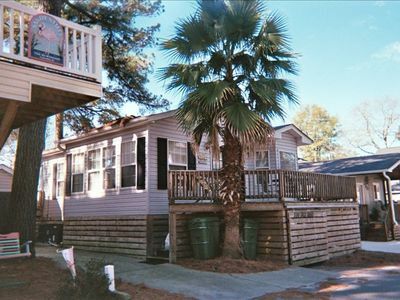 Your very own piece of Paradise..
NEW LISTING! 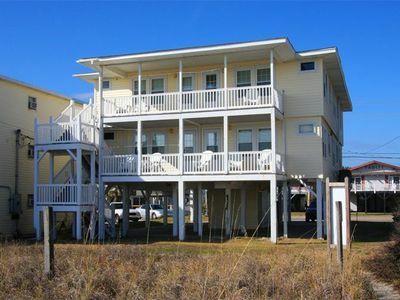 Gorgeous direct oceanfront- end unit in highly desirable location!